Uncle Scrooge is back, and he’s just as we remembered him from his NES days. 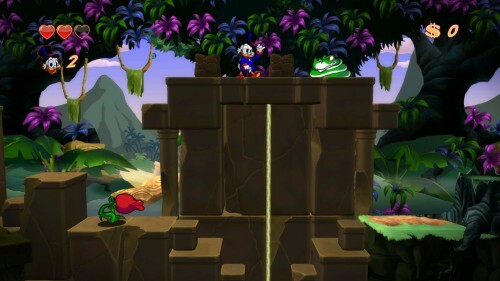 With gorgeous visuals and immersive audio, DuckTales Remastered looks and feels like a modern game, but manages to pack one heck of a nostalgic punch at the same time. And at $15, it’s nostalgia done cheap. As a gamer born in the 80s, I have fond memories of gaming-it-up on the original Nintendo, aka: NES. In 1989, there were two things I couldn’t get enough of: DuckTales on the television, and DuckTales on the Nintendo. 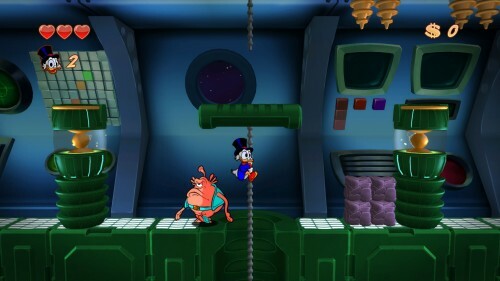 Until WayForward and Disney announced DuckTales Remastered, I admit that I had no idea that both the series and the original game were that popular – especially not popular enough to warrant a remake of the game 24 years after-the-fact. I’m glad it was just me that was oblivious to it, though, because Remastered is pure nostalgia. It takes only a couple of minutes of playing Remastered to understand the care that WayForward put into the game. Clearly, the goal was to retain as much of the spirit of the original game as possible, and the result is that things will feel instantly familiar to those who’ve played that one – even if it’s been a while. To call Remastered a clone of the original but with updated graphics seems accurate to me. 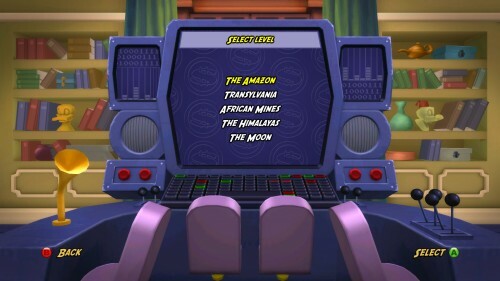 Even the menu system looks familiar, with three difficulty levels to choose from, and the same oversized computer acting as the level-select screen. The levels themselves also retain quite a bit of their original layouts, which is good to see. Throughout this review, I feature a screenshot from each of the five main levels in the game, with a link underneath to show you what the same section (or close) of the original game looks like. To call the difference “night and day” would be quite an understatement. On the topic of graphics, that’s the biggest thing that stands out in Remastered; they’re simply gorgeous. 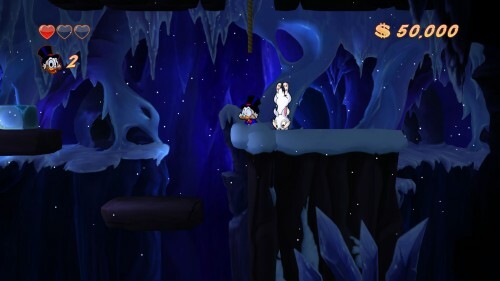 The characters and levels are colorful, and make it feel as though you’re playing inside of a cartoon. The fluidity is fantastic, and I think WayForward has done an excellent job enhancing characters and enemies that lacked detail in the original due to the 8-bit limitations. 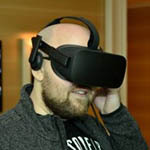 While the graphics are great, so too is the audio. 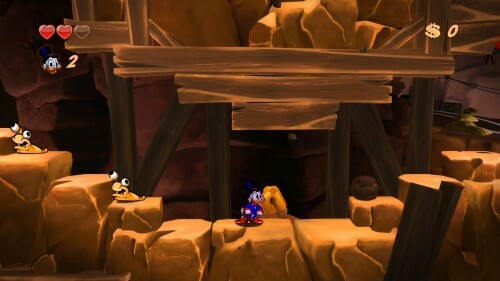 Many voice-actors from the original series were brought in to voice this game, including Scrooge McDuck’s 93-year-old voice-actor Alan Young. The music… just sublime, and bursting at the seams with nostalgia. The voice-acting is one of the first enhancements in Remastered, and it’s all well-done overall. Throughout the levels – at the beginning, end, and when you discover an item – a cutscene will run that turns the game into a brief cartoon. I’ll admit that as much as I enjoyed the DuckTales TV show as a kid, I don’t enjoy it now, and I really don’t enjoy these cutscenes either, which leads me to the game’s biggest fault (but a fixable one). At any cutscene, you can bring up the menu and select an option to skip it. This is appreciated, and something I think all games should have. However, the number of cutscenes in Remastered is high, about 10 per level. Given that these levels are not exactly long, this is a lot of stop-and-go, and thus results in broken momentum. Making matters worse, because this is a rather difficult game, you’re going to be dealing with these cutscenes often. A simple option in the menu to automatically skip cutscenes, I think, would be hugely appreciated. That’d return the gameplay closer to the original game, which didn’t have any lulls in its levels at all. This would not only be useful to those who simply don’t want the cutscenes, but those who’ve already beaten the game and have no interest in seeing them again. Like many NES games, the original DuckTales was challenging. While I did manage to complete it as a kid, it took a lot of time and effort. This was an era of gaming where it wasn’t uncommon to have to replay a level many times in order to master its pitfalls and of course enemy behavior. This is an aspect a lot of people might wish wasn’t carried over from the original, but it has been, making Remastered a very challenging game. This brings me back to the cutscenes complaint. There were a couple of levels that I had to play through at least five times over, and each time I went through, I had to deal with skipping the cutscenes again. You can probably begin to understand why I yearn for that auto-skip option, because it truly does become a little maddening after a while. There’s nothing inherently wrong with NES-style gameplay being brought to modern games, of course. Mega Man 9 pulled it off perfectly. But that game also didn’t riddle each level with cutscenes – that might be the main difference here. I hate to harp on a single point so much, but it’s something the developer can easily fix with an update. Past that, if the game is too difficult, you might need to set your pride aside and choose the “Easy” difficulty (which I’m willing to bet still isn’t “easy” by today’s standards!). In some ways, I do wish that the game’s mechanics were updated a bit, because I feel that this sort of 2D platformer hasn’t translated too well to an Xbox 360 gamepad (or any modern gamepad you might be using on the PC). I rarely felt like I had true control over my character when it came to using the pogo stick; for example, there were many times when I believe I should have pogoed on the ground, but didn’t – sometimes causing death (Amazon’s spikey vines area is a great example of this). In those particular instances, the control can be a downfall, but when in the pogo mode, precision is quite good. It’s just a matter of getting into the pogo mode that is sometimes a little frustrating (interestingly, though, it’s even harder to do in the original). So, patience is needed, or perhaps a retro gamepad. In the original, money had little purpose except to gauge whether you get a good or great ending. In Remastered, money you earn throughout the levels can be used to purchase art assets, such as concept art. This is a fun mechanic that will give players a lot to do if the goal is to collect everything. As far as I’m aware, you don’t actually need to collect money in the game, though it’s not hard to get rich quick. Another fun feature is being able to go into your vault and dive about 50 feet into a pile of gold. While I am quite sure this would kill you in real-life, it’s a fun little side thing to do that I’m glad was included – anyone who’s watched DuckTales or read Scrooge McDuck’s comics knows that playing with his gold is one of his favorite activities. 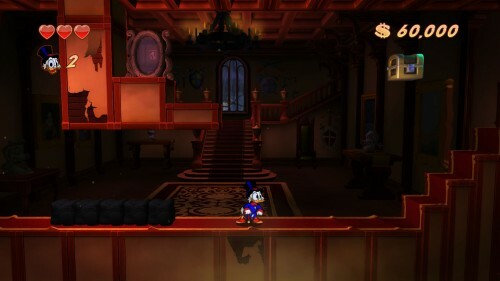 In the end, DuckTales Remastered is a remake in the purest sense – for better or for worse. If you enjoyed the original, or platformers from that era – and a higher difficulty – you’re going to dig this game. The art is amazing, as is the fluidity of it all. The audio is likewise impressive, and overall, it’s a well-designed package – save for the constant cutscenes, that is. Despite its couple of flaws, I’m very glad to have seen this game become a reality. If there’s one thing I can’t get enough of, it’s nostalgia.